This piece was written for VAMFF. It’s the unique intricacies and quirks that make us wholly who we are. Without these, we are not ourselves; we do not truly live the life set out for us. So it was that Kate V M Sylvester unintentionally discovered her craft. What was once a high school habit – gradually pulling at the threads of her uniform – has now become her own masterpiece and creative expression. 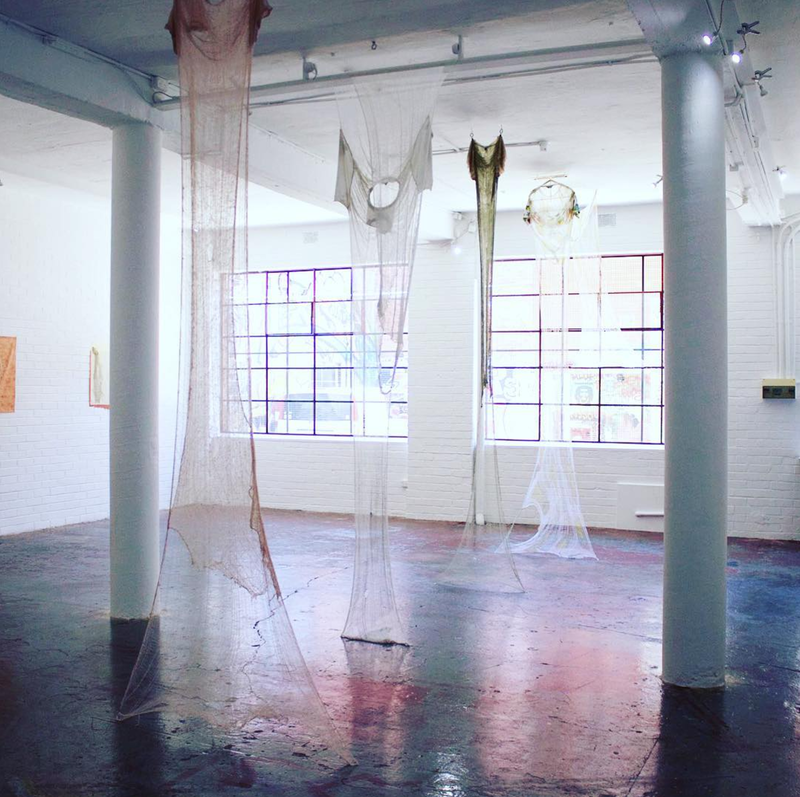 Sculptural de-threaded t-shirts and couched wall-pieces lined the interior walls and ceiling of the gallery on Tinning Street, Brunswick. The t-shirt, the artist’s muse, deconstructed and transformed, took on a whole new, unexpected life. In Sylvester’s opinion, T-shirts are the world’s most iconic piece of clothing and she’s not wrong: we own them the world over, wear them for sports, casual and even dressy occasions. Brands love them; we love them. The concept strings from an exploration of the commodity fetishism – a term published by Marx, whereby people perceive great, intrinsic value in ordinary commodities (like a brand label), often with more importance than staples such as water. The human labour aspect of creation is forgotten. 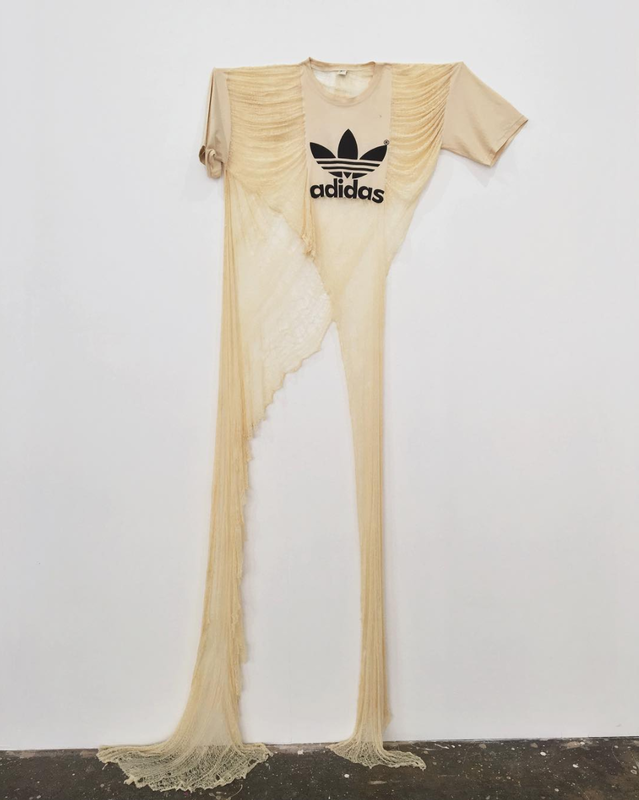 A t-shirt, for example, takes on a whole new meaning once a bit of ink has been splayed across – in this case, Adidas. It changes the way you feel when you wear the garment; it changes the way you appear to others. Sylvester untangles this and brings the fibres, the actual creation process, back into the limelight. The pieces themselves are laced with individuality, showcasing their own personas and attitudes. Take the Grey Oyster Tee for example. 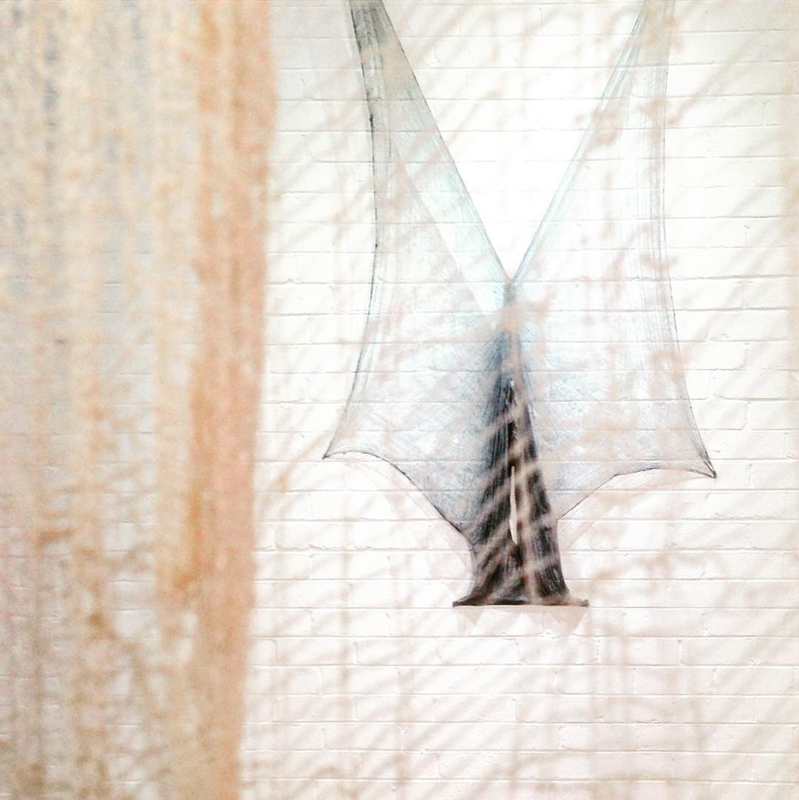 A mesh of fabric, once a polyester t-shirt, becomes a “Victoria’s Secret Model”, as described by the artist. She spreads her wings, she takes her own shape. Each shirt can be moulded and shaped into a sculptural spectacle; a new vision every day. The couched pieces are awe-inspiring works of art in and of themselves, even without the backstory. The embroidery technique fastens a material in place with almost invisible stitches in the same colours. With the opportunity to get up close and personal it transforms you to another world. This attention to detail and precision is what allows for seamless pieces of wall art like these. Each piece, painstakingly created and pulled by hand, completes this breathtaking collection. The powerful thing about art is how it can take on a different meaning to each person, from the artist to all her viewers. For me, Sylvester’s work is a thought piece about the make up of our clothes. So rarely do we consider the weft and the warp; each little fibre and thread that holds together our garments. Without these strong spider-webs of thread we would bare but a naked body. These pieces have a different story to tell for each individual. Each t-shirt has a history (a la the oil-stained taco shop tee). They just need someone like Kate V M Sylvester to hone a talent and share it with the world, encouraging us to understand our clothing and the identity we then determine. Previous Post dressing the modern day suffragette. Next Post investing in the ‘forever’.